If adventure and wanderlust flow in your blood, you should not miss trekking and camping at Tail Baila, a breathtaking tiny hamlet in Mulshi Taluka, near Lonavala. Located 100km from Pune, Tail Baila is a lesser-known village situated in Mulshi Taluka. Although the place is ideal for adventurous activities like trekking and rock climbing, one can also camp in a tent under the stars and enjoy an open-air barbeque. The main attraction is the Tail Baila fort, which was built during the Maratha Empire. 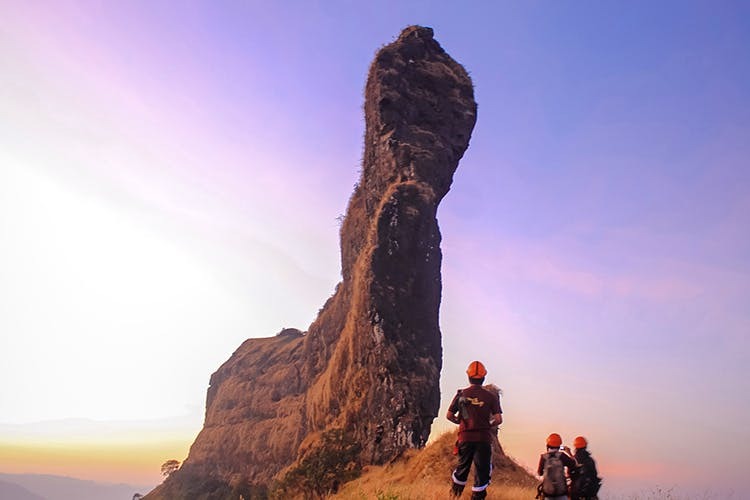 From the peak, one can also view the magnificent Sudhagad, Sarasgad and Ghangad forts. Several homestays and affordable accommodation facilities are available near Mulshi and Lonavala. Trekkers can always get in touch with locals, who can arrange homely food for them on the go. You can enjoy a scenic ride to the village from Pune via Pirangut, Paud, Tamhini and Salter Khind. Another way to get there is from Lonavala via Ghusal Khamb and Machgaon. The trek could be difficult for first-timers as the roads are tricky and a bit slippery. There is a severe network issue as GSM networks do not work even at the base village. Don’t leave your homes without IDs, first-aid kit, water bottle, mosquito repellent, torches and extra batteries.